SynthMaster 'Everything Bundle' includes SynthMaster 2.9, SynthMaster One and all current preset expansion banks released by KV331 Audio. There are currently 29 preset banks by 9 authors which contain 1800 presets for various genres. SynthMaster 'Everything Bundle' also includes a free upgrade to SynthMaster v3.0, which is expected to be released around Q4 of 2019. Compared to purchasing SynthMaster, SynthMaster One and preset banks separately, 'Everything Bundle' is around 40% cheaper. 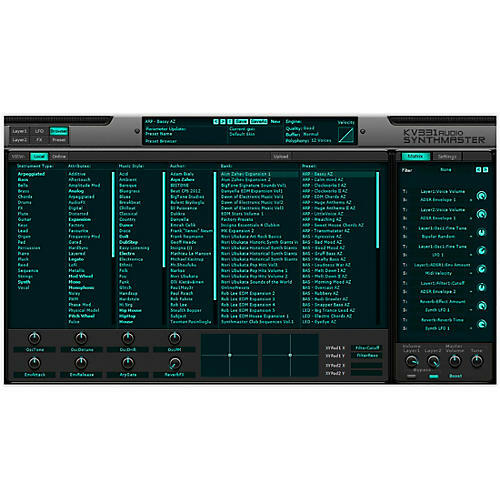 SynthMaster One is an easy to use wavetable synthesizer with an intuitive workflow. Although it shares the same engine with its bigger brother SynthMaster, it comes with new features like wavetable synthesis. With its simple layout, rich wavetable/waveform content and inspiring factory preset library, designing new sounds with SynthMaster One is a real joy. Watch our videos, listen to the audio demos and you'll see how easy it is to design sounds with this synth. SynthMaster 2 is an all-around, semi-modular software synthesizer and effect plug-in that features many different synthesis methods including VA, Additive, Wavetable, Wavescanning, Phase Modulation, Frequency Modulation, Pulse Width Modulation, Ring Modulation, Amplitude Modulation, Physical Modeling and SFZ Sample Playback synthesis. With its multi-algorithm oscillators, analog modeled zero delay feedback filters, flexible effects routing with 11 types of high-quality effects and a massive modulation architecture with 95 separate modulation sources and 650+ modulation targets; SynthMaster is a must-have for all synthesizer enthusiasts.